Process cooling specialist, IsoCool, has introduced anadaptable, efficient and budget-friendly process air-cooled chillerto the UK market.Built with performance and flexibility in mind, the DY-NAX combines the highest standards of construction with a modifiable design, allowing the chiller to fulfil a wide range of cooling requirements, from the most basic through to free and adiabatic cooling. As a result, the DY-NAX is an idealsolution for almost any cooling system. Beginning with the standard DY-NAX, units featurebrazed plateevaporators, and are built without an integral pump and tank group. This enables centralised cooling plant to increase cooling capacity in the most cost-effective way possible, it also makes the standard chiller price-competitive. If required, the DY-NAX can be easily supplied with shell and tube, plus a complementary GRP pump and tank group is also available. Highly efficient, all versions of the DY-NAX boast a range of energy-saving features. Variable speed axial fans with external rotor, for example, are offered as standard, and feature larger-diameter blades which are optimised to achieve high air flow rates with the lowest electricity consumption. Brushless fans can also be incorporated to further increase energy savings. 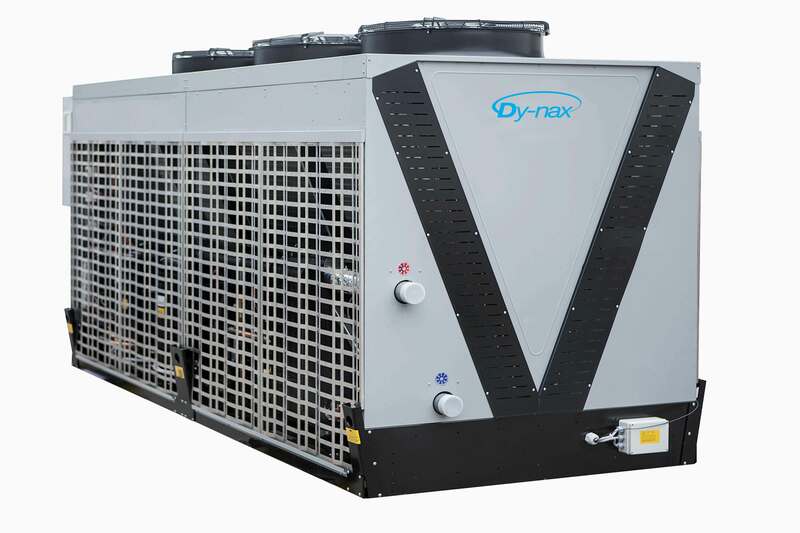 To significantly boost the energy-efficiency of the DY-NAX, the chiller can be supplied with a DCOOLER air blast cooler to deliver free cooling. Here, an IsoCool pump group fitted with a three-way valve provides the energy saving automatically. The aim is to precool the water flowing into the heat exchanger coils of the DCOOLER by utilising low ambient air temperature, thus limiting the energy consumption to only a few fan motors. 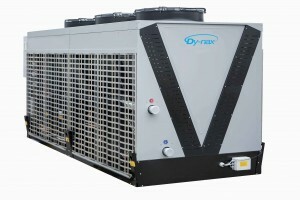 The DY-NAX chiller remains on stand-by, providing a substantial energy reduction. Manufacturers in warmer climates can also benefit from increasedsavings thanks to an adiabatic version of the DY-NAX. When the ambient reaches 32oC or more, the adiabatic pack on the chiller introduces water to the internal matrix, precooling the air temperature. This increases the seasonal energy efficiency (SEER) of the unit to 5.15. Exceptional build quality is apparent throughout the DY-NAX, as the chiller boasts a range of innovative features. For example, the cooling circuit is constructed from high quality copper pipes and refrigeration components, including first class control and safety devices, to meet the most demanding industrial applications. During operation, the evaporator is prevented from freezing thanks to two safety devices: a flow switch regulates the minimum flow rate; and an anti-freeze thermostat switches the compressors off if the water temperature is too low. Electronic expansion valves are fitted standard, and in the water circuit, the inlet and outlet chilled water connections are situated opposite the electric control connection, so as not to interfere with access to the electric panel and allow easy connection to the process water circuit. What’s more, the outlet water temperature can be as low as 5oC without any need for glycol. Thanks to heavy-duty galvanised steel construction and special cataphoric and epoxy coatings, the units can be located outdoors without shelter. Condenser fins can also be coated with anti-corrosion paint or made from aluminium with a pre-coated protective barrier. If the chiller is to be located near a coastal region or is used for aggressive industrial applications, units may be constructed from stainless steel. Standard DY-NAX units are available from 80kw to 690kw, while shell and tube versions start from 180kw. For more information on the DY-NAX series of chillers, as well as the DCOOLER and ADY-NAX range of models, please contact IsoCool: www.isocool.ltd.uk, [email protected] or +44 (0)1376 328455.